These orange smiling pumpkins are a must have treat for this Halloween. 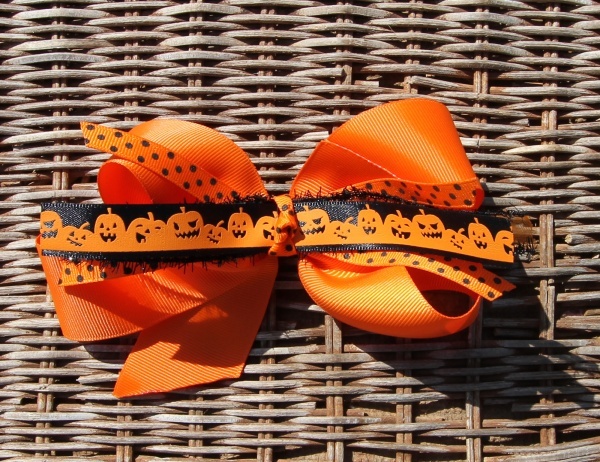 This is a 1.5" orange grosgrain base bow that has 4 pieces of different kinds of ribbon. 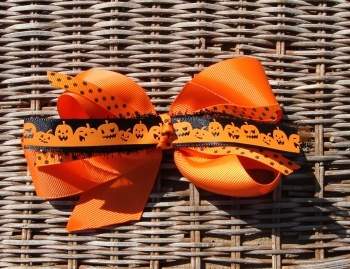 There is first the black satin ribbon with the orange smiling and frowning pumpkins in a row. Then an orange sheer satin ribbon with black fringe edges running underneath. Orange and black polka dots are on the bottom in a criss-cross pattern and it wraps the center into a French knot. All of this Halloween extreme fun is attached to a French clip and ready to go to all your Fall Festivals. Happy Halloween!